As his troop ship sailed for Europe in World War I on March 30, 1918, future president Harry S. Truman remembered, "there we were watching New York's skyline diminish and wondering will we be heroes or corpses?" The patriotic 33-year-old farmer had volunteered to serve as an artillery man in action in France. The new exhibition at the Truman Library and Museum in Independence gives a very personal, insider look at what that experience was for Truman with enlarged pictures, reports from the battle zone, personal memorabilia, and probably most important quotes from letters that Truman wrote to his future wife Bess. In 1905 Truman had joined the Missouri National Guard where he learned the basic skills of an artilleryman in monthly drills and summer encampments. He had to withdraw in 1911 because of the demands placed on him to support his mother and sister by working full time as a farmer after his father died. He had tried making a career in oil and mining, but nothing had been profitable. He was in love with Bess Wallace, daughter of the highest status family in the area. Her mother was not happy with the possibility of her daughter marrying a farmer with no formal education beyond high school. He noted, "I was a Galahad after the Grail and I'll never forget how my love cried on my shoulder when I told her I was going. That was worth a lifetime on this earth." They planned to be married if he returned. Truman was a letter writer and 1,300 of his letters to Bess still exist. Many of these letters form the basis for one of the most engaging aspects of this exhibition. He reported to her what was happening in the war and how he was reacting. Before going into battle additional training was necessary. He wrote Bess, "We have been working harder than ever. I had an examination Saturday that would make the president of Yale University bald-headed scratching his head trying to think of answers." First he had to get the artillery battery of 200 Irish and German Catholics from Kansas City under control. They had already proved too difficult for several officers with their stubborn, undisciplined behavior. His response was "I was rather doubtful of my ability to handle that obstreperous battery." A critical moment occurred when they were subject to incoming artillery fire, and one of the men shouted, "Run fellows they got a bracket on us." Truman stood his ground while screaming profanity at the fleeing men to return. They did. Their guns and horses got saved, none of his men were killed or injured. The battle showed the men of Battery D that their small bespectacled captain could hold his ground under challenging conditions. Later he wrote Bess, "The Central Powers have asked for peace and I was in the drive that did it! I shot out a German battery, shot up their big observation post and ruined another battery when it was moving down the road. We plastered 'em'!" At the end of the war his unit had performed well in battle and was in excellent condition. He comments on censoring his men's letters in a letter to Bess, "I had no idea that there were so many accomplished liars in any organizations on earth as I have in mine." He was responding to their inflated tales of heroism and accomplishment. He used his time immediately after the war buying a car and traveling widely around France learning as much as he could about the country and the people. This war experience was to be valuable training for some of the critical decisions he was to make later as president. In addition there were friendships he made with men who would become valuable supporters later in his life. He married Bess Wallace June 28, 1919. Her mother was in attendance. Truman stayed in the reserves and left military service 27 years later as a Colonel in the U.S. Army Officer's Reserve Corps. In another story I will discuss what critical decisions Truman made as president. When he left the presidency, only 30 % favored him, but now experts rate him as the sixth best president we have had! This exhibition will be at the Truman Library and Museum until December 31, 2018. Harry and Bess's wedding following the end of the war. CAN ZOOS SAVE ENDANGERED SPECIES? Carla and I, as fans of zoos, are particularly interested now in how successful zoos will be in trying to save some endangered species. Earlier for years we had enjoyed taking our daughters and later our grandchildren to see the exciting variety of animals at exhibitions. When zoos first opened, mostly cages were used for animals. This is an uncomfortable situation for the animals with little stimulation, little room to move around and little natural surroundings. Eventually this was recognized and some staffs were able to more often arrange environments more like the ones the animals came from. For example, at the San Diego Safari Park and Busch Gardens in Florida we were the ones in cages (buses) traveling the wide open areas in which the animals also had housing. Elephants at the St. Louis Zoo seemed to be suffering from too little space to move around in. The problem of space is still not completely solved. At the St Louis Zoo although the elephant area was bigger than that of other zoos, they still seemed unhappy. They stood swinging their trunks and slowly shifting their weight from side to side, looking sad. When I attempted to take a picture, two of them turned their back to me as if annoyed by my attention. We found this same attitude of boredom among the great apes. When we were in Georgia, we were fascinated by how innovative Zoo Atlanta staff members were as we watched them stimulated gorillas with activities and tasks designed to try to keep them more mentally alert, a little more challenged as they would have been in their natural setting. The Zoo Atlanta has the largest collection of lowland gorillas in the U.S. and their gorilla program is one of the best--very different from how zoo animals were treated in the past here and in most zoos! On our more recent visits to zoos we often ran into these words :Endangered, endangered, threatened, endangered. The red letters on the identification plaques at many of the animal compounds seemed to "scream" at me. Extinction faces many animals today. Addax, only 200 left in the wild, pink pigeons, grizzly and polar bears, cheetahs, many species of leopard, okapis, on and on from all parts of the world with not enough survivors left to have a viable breeding population. And the problems of survival are growing. In the past 40 years it is claimed that 52% of the world's wildlife has gone extinct. The main reasons are the loss of natural habitat, climate change and poaching. Many of them will no longer be around when my great grandchildren go to the zoo. Somehow I don’t feel their being able to see them on a virtual reality disc will be quite the same thing as seeing them up close and personal. What is being done? We have gained some idea from our visits to a number of zoos that are taking this decline very seriously and are undertaking programs in cooperation with other zoos to save at least some of the endangered animals. Some examples: In reaction to this threat the Saint Louis Zoo has become a center of conservation, education and research on endangered species. Over the past 50 years, cheetahs have become extinct in at least 13 countries. The main causes of cheetah decline are the humans concerned about their cattle, lions and hyenas taking their kills away and lack of genetic diversity due to interbreeding. Cheetahs inside their man-made habitat at the Saint Louis Zoo. The zoo has a cheetah program that returns some of the animals to the wild. The St. Louis Zoo has had success in breeding a number of animals in captivity, and since 1974 has produced more than 30 cheetah cubs and been able to return these and some other animals to areas where they had become extinct. At the Sedgwick County Zoo in Wichita, the Guam Kingfisher and the Guam Rail on display are both extinct in the wild because of the Brown Tree Snake has done a complete job of removing them from Guam. One hundred and fifty Kingfishers are in breeding programs with the staffs hopes to eventually return them to Guam's forests. Areas have been cleared of the Brown Tree Snake and an attempt was made to return the Guam Rail to its home territory, but feral domestic cats killed them. The Kansas City Zoo along with other species is working with African wild dogs Only about 7000 are left in Africa and they hope to breed enough of them to share with other zoos. These examples are small steps to correct a large problem, and not all zoo personal are hopeful. When we attended talks by the animal handlers of chimpanzees and great apes, at Busch Gardens in Florida the ape handler, who had lived in Africa, felt that with present conditions in Africa the only place where apes will continue to exist would be in zoos and animal parks. It will be interesting to see what new programs will be introduced to increase the number of animals and what steps we might take to avoid extinction of many of these threatened animals. Apes are being hunted to extinction both as food and for souvenirs. At the Chesterfield Butterfly House on the edge of St. Louis, Carla and I found ourselves happily immersed in exploring the unusual lives of butterflies. In their lives they go through four changes and each change results in quite differently shaped creatures. The visit started with a movie outlining the lives which included the various ways the butterflies interacted. Mating varied depending on the kind of butterfly. The female may respond to the beauty of the male, they may do a courtship dance, or he may cast a mist over her that makes him absolutely irresistible. The female mates only once, the male may mate again, but regardless of the number of females he serves he soon dies and the female sets about laying her eggs, maybe up to 500. There is a very important choice here for her for she must lay the eggs on plants that the caterpillar who comes from the egg can eat on the plant. The eggs hatch in 3 to 8 days and the resulting caterpillar grows quickly in order to create the third stage of their lives in three to five weeks: the chrysalis. Being a caterpillar is a dangerous stage as many predators are looking for them as food. Different defenses have been developed by different varieties. If they taste bad, the predators learn to avoid anything that looks like them. Some caterpillar get by, by just looking like they are the taste bad variety. Having colors that blend in completely with the environment is also good. A few have developed barbs on their bodies that also help them avoid becoming someone's dinner. Now the magic stage of development where the caterpillar becomes a pupa or a chrysalis. It finds a ledge to hang from and covers itself with a heavy coating. Inside the cocoon the metamorphosis occurs with the old body parts become the beautiful butterfly that will emerge. When the butterfly emerges from the pupa, it is weak and needs time to pump blood into its wings and then let them dry. Finally it flips itself off the ledge and with it companions creates a fascinating world of motion. In the butterfly building we were surrounded by an assortment of children. At the movie the little ones had paid no attention to the screen, but here their attention was focused as they watched the wide variety of butterflies either flying or dining. Surrounding us were 60 different varieties of butterflies from around the world: Australia, Southeast Asia, South America and the United States. Because each has its own diet requirements the room was filled with a 150 different plants from all the places they came from. Most of the butterflies we saw were drinking the nectar from plants and flowers through their tongues that work like straws. They would rest on plant for brief moments and then quickly move on, so we were surrounded by constant motion. The Magnificent Owl with the large eyes on its wings were dining on rotten bananas hanging from supports. A large number of Blue Morphos from Central America were dining off flowers. Fruit trays with a variety of fresh fruits were available, but most were looking for a particular flower or plant to feast on. We were there on a rainy, cloudy day so we didn't take advantage of the Butterfly Garden where they have both native and migrating species available for viewing. A short distance away is the St. Louis Carousel. Built in 1921 it has 60 hand carved horses, four deer and two sleighs. By 1979 time had taken its toll and carousel was retired. In 1987 it was put back into action in a climate controlled building to insure its preservation. We rode the highly realistic horses enjoying the up and down motions, but something was lacking. It was the screech's of our grandchildren that we had enjoyed on previous carousels and ventures. We enjoyed our time in St. Louis and were especially pleased to see so many adults, teens and children exploring the museum. 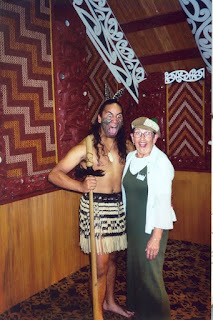 Recently when reading the book Captain Cook by Alistair MacLean, I was taken back to memories of Carla's and my trip to New Zealand and our visit with the "fierce" people. 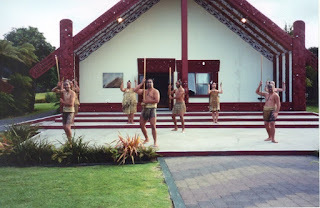 What we experienced in 2004 continues to be an integral part of the country's tourist attractions, and I highly recommend you attend a Maori ceremony. In the 1770's when Captain James Cook was charting the Pacific Ocean and claiming land for the British, he ran into the fierce tribes in New Zealand now called the Maori. They were very opposed to visitors to their territory and at one point his companion support ship lost 12 men who when landing for supplies were killed and eaten. On several occasions Cook had to order Maori killed who were attacking his sailors. The fact that people already inhabited the land made no difference to the British who later returned to take over their new territory claimed by Cook. 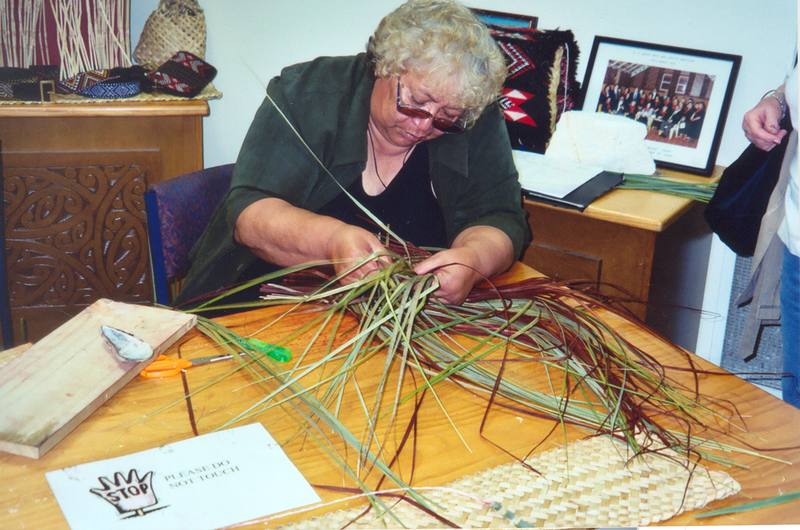 We started our tour of the Maoris in Rotorua where we visited the Maori Arts and Crafts Institute. From there we were taken on a ritual experience and dinner with the local Maori. We elected a member of our touring group to be our "chief" to represent us in the Maori welcoming ceremony, or powhiri. He stepped just inside the entrance of the Maori compound. There was blowing of the war trumpet, and three almost naked Maoris with long clubs came out of the ancestral house making a series of challenges in a warlike reception. They had tattooed faces and this along with their grimaces and stuck-out tongues, had the desired effect of impressing us with their fierceness. The warrior who can stick his tongue out the furthest, bulge his eyes the biggest and make the most frightening face has special status with his group and is also considered the most desirable lover. Despite the menacing behavior our chief stood firm. A warrior then stepped forward, laid down a leaf that was picked up by our chief. This sent the message we had peaceful intentions. Maori women then sang a welcoming song and allowed us to enter the community house. Each wall panel was intricately decorated with a family history. Their Chief then made a welcoming speech, and our chief countered with one that indicated we only wanted to peacefully enjoy their company. We skipped the ritual nose-rubbing because an infection was said to be making the rounds. They then put on a show of Maori lore that also demonstrated their musical instruments. One of the dances was the pukana haka, a ferocious display where the dancers slap their thighs, stomp their feet, shout, grimace, bulge their eyes, stick out their tongues and beat their chests. All of this imitation violence was a demonstration of their power as warriors. This was pretty up close and personal, and I found my stomach roiling in fear despite my awareness they really weren't going to attack me. In the Tititorea, dance batons were passed between performers, testing their agility and coordination. The Poi dance featured balls suspended on the ends of rope, depicting the movement of birds in flight. After the demonstrations our group then moved to the dining hall, where we were treated to a Hangi, a dinner cooked in the Maori manner in pits of hot coals with the food wrapped in wet leaves. The food was left in the ground for three to four hours and resulted in tender meat and vegetables with a smoky favor. The Maoris are an integral part of the New Zealand tourist industry. For example, the Auckland Museum has the world's largest collection of Polynesian artifacts, including a 95-foot Maori war canoe carved 150 years ago from a single tree. There are more options for today's visitors to New Zealand to observe and interact with Maori culture like we did. Besides Rotorua organized tours are available in Northland, Auckland, and Canterbury where you can take part in a traditional Maori welcome and have an experience very similar to ours.